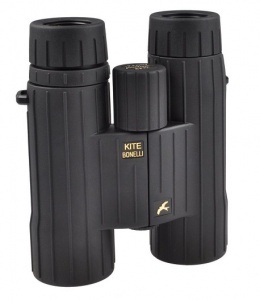 The Kite Bonelli 8x42 is simply the best instrument in its class equipped with large diameter ocular lenses that allow a very large field of view with sharp edges. Making its impressive image possible, are the very large prisms and lens elements inside. The Kite Bonelli’s complex lens and prism system contributes to its total weight. Nevertheless Kite has managed to keep this weight under 840g, applying an aluminium-magnesium body. Equipped and treated with the best technologies and finest Kite coatings, the colour reproduction and sharpness provided by this instrument are astonishing. That’s why several tests have shown the Kite Bonelli to be the best value for money within today’s high segment of sports optics.